We have continued meet on the first Thursday of each month at different churches within the team with exception of a summer and Christmas break and have enjoyed many hours of friendship and fellowship as our garments have been created. 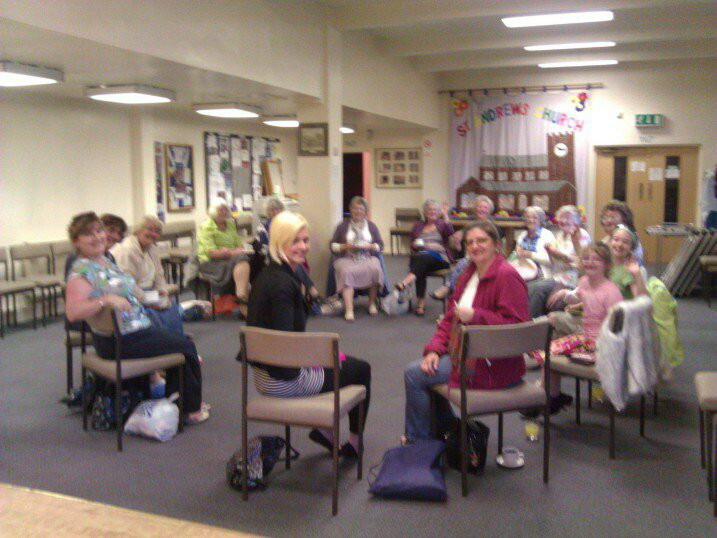 Our meetings have included being invited to meet at Maghull Methodist church. Thanks to Jan West for the invitation and welcome. We have continued making shawls, blankets and items of clothing. Prayer Shaws are made for those in need of comfort during times of sickness, worry or mourning. Once again Eileen Kermode from St Andrews responded to a request from the Methodist church where a Christmas tree festival was displayed and took our prayer shawl Christmas tree as part of the display. The tree itself is decorated with knitted and crocheted ornaments as created by our prayer shawl members and they are displayed each year during Christmas at St James. We added a few new crocheted snowflakes made by Joyce from St Andrews and Jill from St James donated some stockings (Christmas kind!!). We still receive letters and cards of thanks from people who have received shawls and blankets and how they are comforted by them and the prayers and work that have gone into creating each garment. In last years report we mentioned a blanket which was unfinished by the late Eileen Pennington. I am pleased to report it is complete and has been taken by a member of St Thomas church during the annual memorial service in November. We displayed our shawls and blankets at St James and St Thomas annual memorial service and many were taken either for the person themselves or for others who would benefit from a shawl. It is good to know that we can reach others we don’t know in some small way bringing them comfort. We pray that we continue to be creative through prayer and the work of the Holy Spirit and look forward to the year ahead. If you can knit or crochet and would like to get involved in this special prayer ministry you will be made very welcome. Even if you don’t knit or crochet but would like to get involved or see what is going on you too will be made very welcome. The group meets on the first Thursday of the month at 7.30pm either at St Thomas, Melling or St James, Maghull. For more information on the Prayer Shawl Ministry please contact Pat Dunbar on 0151 531 0073 or email patcol@blueyonder.co.uk and she will be happy to give you more information.